It’s International Mountain Day! At Legado, our team is celebrating the grandeur and biological importance of the world’s mountains, and the tenacity and innovation of mountain people everywhere. Mountain people like Avelina Sabonete, who grew up in Mount Namuli’s Mucunha Community and is now entering a new role as a community leader as a member of the Mucunha Natural Resource Committee. Avelina is a farmer who wanted to help her community decide how to direct the use and protection of Namuli’s natural resources. As a leader, she aims to inspire others to invest in the mountain. She is also investing in her own future by pursuing her dream of becoming a nurse. Mountain people like Muktar Adbi, who grew up in Ethiopia’s Bale Mountains, has an MA in Natural Resource Management, and currently is working to transform education in Southern Ethiopia. In 2015, Muktar and I hatched a plan for him to come to Mozambique and share his deep knowledge and commitment to the mountains, leadership, and development as part of our recent Lightyear Leadership program. After three years of work, this August, Muktar finally got to stand beneath Namuli as a teacher and a collaborator. Mountain people like Charlie Harrison, who grew ski racing in New Hampshire’s mountains and continued on to explore the world’s mountains. Charlie, at just 19 years old, first came to Mount Namuli with me in 2014 as a climber. He returned to the summit again with me this past August, after recovering from what could have been a career-altering injury. Charlie is driven by an insatiable desire to play in and protect the world’s mountains — recognizing that with the opportunity to enjoy them also comes the great responsibility to guard their futures. So today (and every day), here’s to the mountain people, near and far, by birthright or through passion. Here’s to tenaciously working together to preserve their homelands. Honor your love of the mountains and their people with a gift to Legado today. Your support will go directly towards protecting the world’s most threatened mountain ecosystems and empowering the people who call them home. Happy International Mountain Day,Majka BurhardtFounder + Executive DirectorP.S. 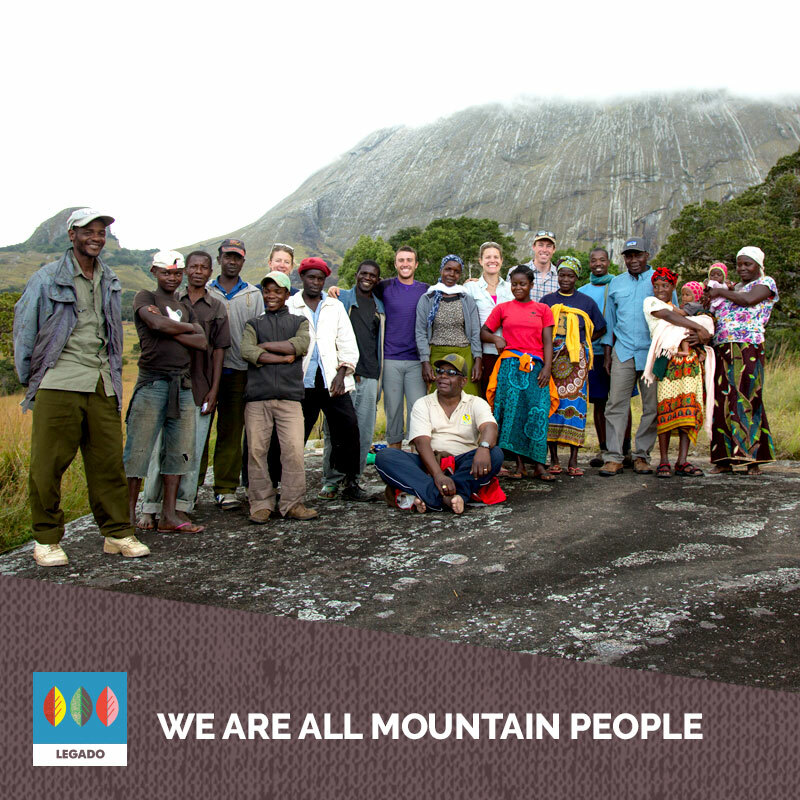 The photo above is of many of the original group of Namuli community members, climbers, and LUPA team who all took a leap and launched this work with us all together on Namuli back in 2014.